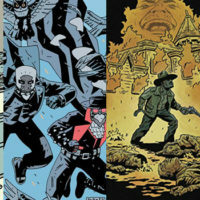 Campfire is a New Delhi based publisher comprised of Western writers and Asian artists, with an ever-expanding range of titles mostly comprised of adaptations of literary classics. Legend: The Labors of Heracles isn’t adapted from a celebrated novel, but is instead a faithful recounting of the twelve labours of Heracles, the son of Zeus perhaps better known as Hercules, his Roman counterpart whom contemporary fiction rarely distinguishes between. This book is aimed at younger readers (each of Campfire’s titles even have a charming “This book belongs to _______” box on the inside front cover) and uses the frame tale of a scholar recounting Heracles’s many adventures to a young pupil to keep the storytelling lean, straightforward and involving. There’s also a section at the back of the book detailing other Greek heroes such as Perseus and Jason, comparing them to the likes of Spider-man and Batman. Ryan Foley writes clearly and concisely, and it’s difficult to imagine any younger male readers struggling with the story or being anything but enthralled by Heracles’s tragic tale. Perhaps the most alluring thing about these mythological tales is that they are so bloody brutal. From Heracles and Iolaus severing the heads of the Hydra and searing its stumps so that they no longer grow back to the Son of Zeus skinning the invulnerable lion of Nemea with its own claws, this book will satiate even the most bloodthirsty little blighters. All in the name of education, of course. Though it should be stressed that while the book does frequently depict graphic violence – the majority of Heracles’s labours involve him slaughtering a beast of some kind – the red stuff is kept to a minimum. Sankha Banerjee’s art is fine, if a little inconsistent at times, and he does a good job of maintaining the look of Mythical Greece through recognisable architecture and presumably historically accurate costumes. But the wonderful colour work by Ajo Kurian really sets Banerjee’s illustrations off, with each of Heracles dozen trials having its own characteristic colour scheme. 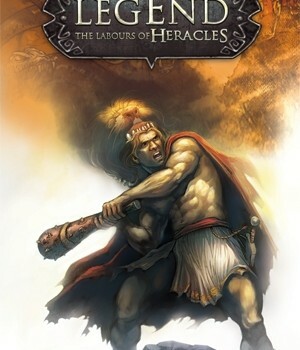 Heracles is a character who has been depicted so many times in modern fiction, from the colourful Disney movie and his appearance in Jason and the Argonauts to a self-referential 90s TV series and numerous video games, that it’s often difficult to distinguish the original myths from the latest reinvention. 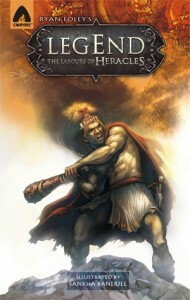 Ryan Foley never forgets that he’s writing to educate as well as entertain, and that’s perhaps what I enjoyed most about Legend: The Labors of Heracles; not only does it condense Heracles’s epic odyssey into a mere 88 pages but it does so as faithfully and colourfully as you could possibly want. Definitely one for the adults as well as the kids. I would like to thank you for the wonderful review you gave of LEGEND. You really understood the whole premise that we were trying to convey by blending an educational message with a rousing tale of adventure. I am still what I think the industry would consider a “rookie” writer. You always hope that your vision will connect with your readers so it is very nice to get a review that shows that the vision has been achieved. Please note, that LEGEND is only the first of many Greek adventures that Campfire has lined up. I am looking forward to seeing more of these stories come to light and I hope that you equally enjoy the forthcoming adventures. Thanks again and keep reading!